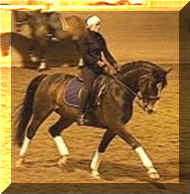 Davidor Best dressage stallion at his Keuring out of 35 participants! Recently placed several times/different shows and is now qualified for the riding horse Championat! Don Stefano Black Beauty, a world class horse! Pretty is, what pretty does, check this one out! Divali Flying changes already in place, young and beautiful! London Star Stunning black horse, bloodlines to fall in love with! Flashdance Super bloodlines and looks, amazing movement! Dumbledore Prospect for the upper levels of dressage!